We all have stories to tell. We share them with our friends, family and even the world through the social media. There is a time and space for this type of art form. I use my blog as a forum to share knowledge of culture, people, landscapes, business, heritage and history of the Great Northern Peninsula. Our way of life has been viewed by nearly 180 countries world-wide and edging closer to 200,000 views. I may not have the talents of my grandfather Mitchelmore for storytelling, but I do my best to convey what is truly authentic to rural Newfoundland & Labrador. This past weekend, my sister and I had a unique opportunity to be in the audience at the St. John’s Arts & Culture Centre and were spectators to a performance scripted by a local playwright, Megan Coles. When I picked up my tickets at the box office, I was asked my address. I responded, “Green Island Cove”. The person asked where that was and I said, “The Great Northern Peninsula”. She said, I will be in for a real treat with tonight’s showing and that it has been getting great reviews from those in attendance. This certainly raised my expectations, especially since Friday and Saturday night’s performances had sold out. The very first soundbite set the stage of framing for the audience the hardship the moratorium would have on our way of life in rural Newfoundland & Labrador. Actors Greg Malone (Author of “Don’t Tell The Newfoundlanders”), Joel Thomas Hynes and Renee Hackett turned the clock back more than twenty years and had us reminiscing only in the stories our parents and grandparents could had told us. 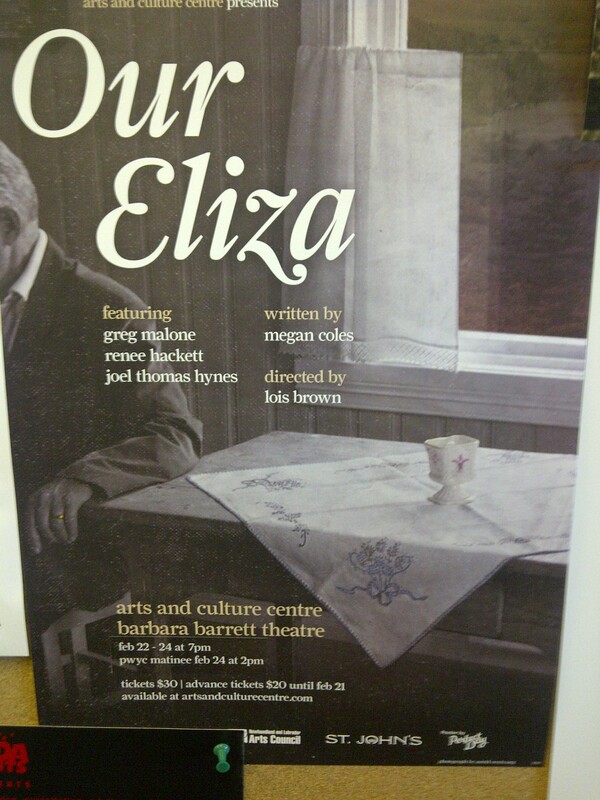 Our Eliza, is the typical Newfoundland girl, who becomes a woman and the glue that kept many of us together especially when times got tough. The modest, yet powerful story that lasted about 1 hour and half was filled with humour, wit and antics in which I could easily relate. I do not want to give away the story-line I want you to go experience it for yourself. These talents have engaged in putting our culture, our life experiences into performance, which brings together many art forms. We can all learn something about our roots and the role in which space plays in it. I took a Newfoundland Society & Culture, in which I learned much about community order and our every day space. It was pleasing to hear writer and co-producer Megan Coles, and co-producer Shannon Hawes, founders of The Poverty Cove Theatre Company open the show highlighting the minimalism utilized in staging, as well as the desire to be able to tell this story in non-conventional spaces. On March 2 & 3, the performance has found a home in the Library of the St. John’s Arts & Culture Centre. You can purchase tickets at www.artsandculturecentre.com. Thank you Megan Coles for sharing with us your creative talents and all those involved with the current production. You have made Our Eliza, a part of all of us. I only hope this story gets told throughout rural Newfoundland & Labrador where it can be at home, especially the Great Northern Peninsula. We are moving into 21 years and a cod moratorium remains. A decision that has forever altered the way of life in rural Newfoundland & Labrador, especially the smallest of communities. The closure of the cod fishery in 1992 was to be temporary, yet remains today. It has led to mass out-migration. I was only 6 years old when the cod moratorium came into effect and can certainly recall many families leaving, businesses closing and loss of services. In 1991, the province’s population was 568,000, in 2011 the population dropped to 514,000 – a net loss of 54,000 people or more than 10% of current population, according to Statistics Canada. The Great Northern Peninsula has been greatly impacted, as the fishery remains today the backbone of our local economy. The loss of population, especially youth and young families adversely impact the amount of tax base available and will push our smaller communities into greater decline. The lack of youth as part of our demographics means we must press our seniors to continue to be committed volunteers longer. These youth that would become community leaders, create new community programs and social offerings or start a business are lost to more urban centres and other provinces that offer high-paying jobs. Since the first Mitchelmore came from England, they have been fishers. I am the first generation, like my cousins that did not have the option to continue a profession our family has engaged for centuries. Where will this lead rural Newfoundland & Labrador? There are cod in our waters, no question. I could see for myself this summer in communities such as Englee, St. Lunaire-Griquet and Sandy Cove as large cod-fish were landed via small commercial quota or caught in the recreational cod fishery. In September, I captured this photo at a fish market in Iceland. As you can see there are certainly giant cod out there.